Now that you’ve completed the material related to Chapters 3, 4, 5, and 6 of your textbook, you’re ready to complete Graded Project 2. For this graded project, you’ll use many of the C# skills you’ve learned thus far. Follow all the instructions for this graded project, and follow good programming practices as you create your solution. Remember to include all the required components when you submit your solution. To finish this graded project, you must complete a number of tasks to create the necessary solution. In this graded project, you’ll create a program named TeeBall.cs as outlined in Exercise 9 on page 270 of your textbook. 1. Start a new C# project named TeeBall.cs. 2. Save the TeeBall.cs program in the Chapter.06 folder on your C drive (Figure 4). The program location will be specific to your computer. 3. Follow the directions listed for Exercise 9 on page 270 to create a program that stores statistics for a Tee Ball league. Note: It may be helpful to review pp. 233–236 and 252–256. 4. Save the updates to your program. 5. Now build your program by selecting Build from the menu bar (Figure 5). Your program will automatically build. Any errors that could occur in the code will typically be shown at the bottom of your screen. 6. After you’ve built your program, test your program by selecting Debug > Start Debugging from the menu bar (Figure 6). Your program will execute and display results. If any errors occur during the execution of your program, you’ll be prompted and taken back to your code so you can make corrections. 7. If necessary, repeat Steps 5 and 6 until your program works as intended. The Tiny Tots Tee-Ball league has 12 players who have jersey numbers 0 through 11. Th e coach wants a program into which he can type a player’s number and the number of bases the player got in a turn at bat (a number 0 through 4). Write a program that allows the coach to continually enter the values until 99 is entered. 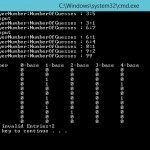 Store the statistics in a two-dimensional array. At the end of a data-entry session, display each player’s number and the number of 0-base, 1-base, 2-base, 3-base, and 4-base turns the player had. 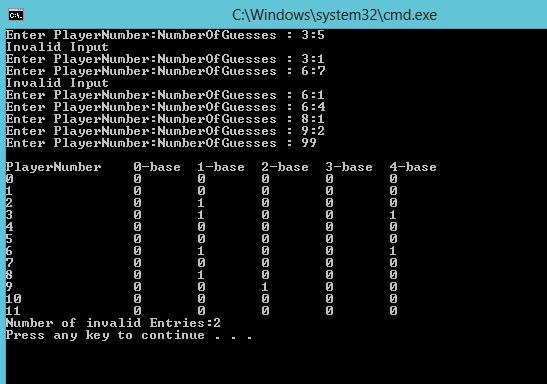 Display a separate count of the number of data-entry errors the coach makes (a player num- ber greater than 11 or a number of bases greater than 4). Save the program as TeeBall.cs.